"Everyone's body runs a little slower in the winter. We tend to want to sleep more, eat more, and there tends to be an increase in the craving for carbohydrates compared to other times of the year. It's a kind of hibernation tendency, which is the brain's response to shortened daytime hours. In the U.S., the winter holidays coincide precisely with the least amount of daylight throughout the year. So they occur at a time when our bodies are most likely to want to crawl into a cave and go to sleep and do what a bear would do: Eat and sleep." 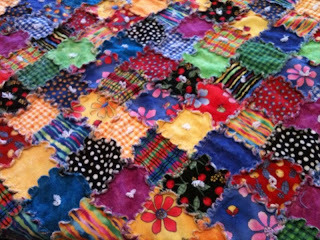 What makes it a "rag" quilt is that the squares are sewn with the seams on the outside. The seams are then clipped and the quilt washed, which makes the seams fray. Traditionally, both sides of a rag quilt are sewn together at the same time, blocks back to back, with one side showing the frayed and the other showing finished seams, but we opted to put on our own back with ties. It's very cute. And a great project for Daughter and I to work on together. Your statment is true, now I will use that for the reason it has taken me two weeks to dec orate my tree. It was put up Thanksgiving weekend, I am still working on it. So that's why I'm eating so much Stollen.